And there ya have it!! Quick and easy and sure to delight the kiddos.... Now that I've shown you my take on the challenge, I hope you'll hop on over to see what all of my Design Team Sisters made for inspiration... Then, I hope you'll enter this week's "Halloween Treats and Decorations" Simply Sunday Challenge at Getting Cricky... We can't WAIT to see what you create!! Love your treat bag! That monster looks like it could be a distant relative of Elmo. I can do nothing but bow to your excellence, Amy! Each project you undertake is unique, fabulous and so amazing it makes me want to run to my craft room and hide under my stacks of paper! Seriously! I am not worthy to post in your presence! This is so darn adorable...I wish I had your creativity! 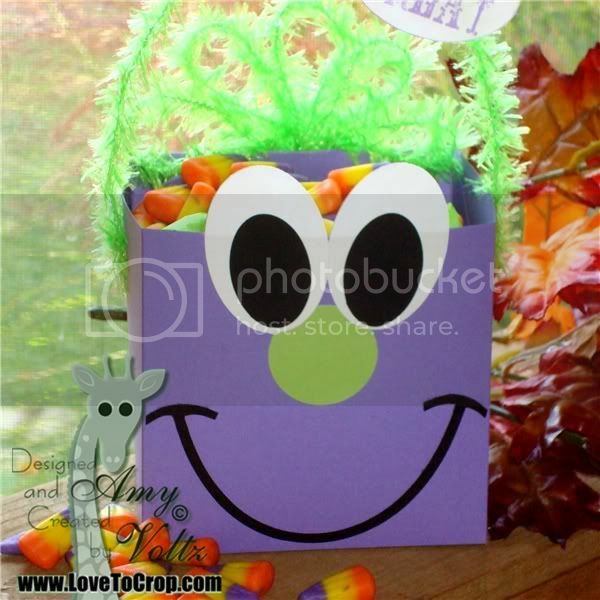 This cute monster bag is the perfect Halloween treat holder! Love, love, love it, my so sweet and fabulous friend!! 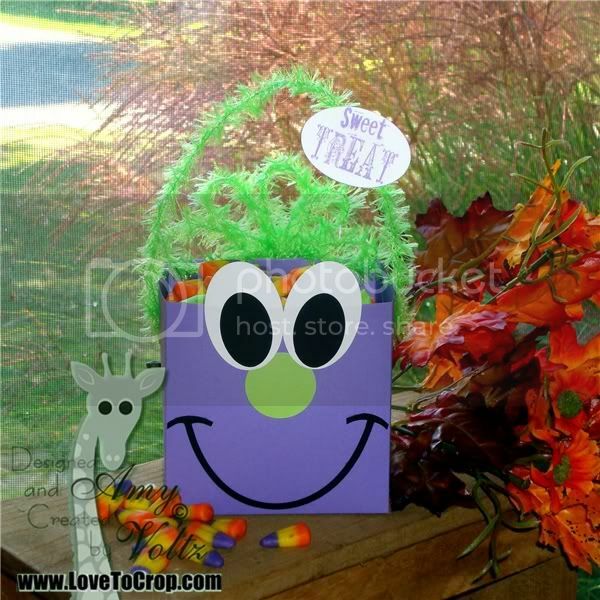 Love the bag, so cute and the candy holders look yummy!! lovely projects! the treat bag is soooo cute! Just adorable! Humm...I just thought of a project I could make for this, I might have to join in the fun! Cute treat bag! And your other projects are amazing! Thanks for sharing. Oh Amy, I just always love to see your creations. You have such a great talent. Well, this is so cute! 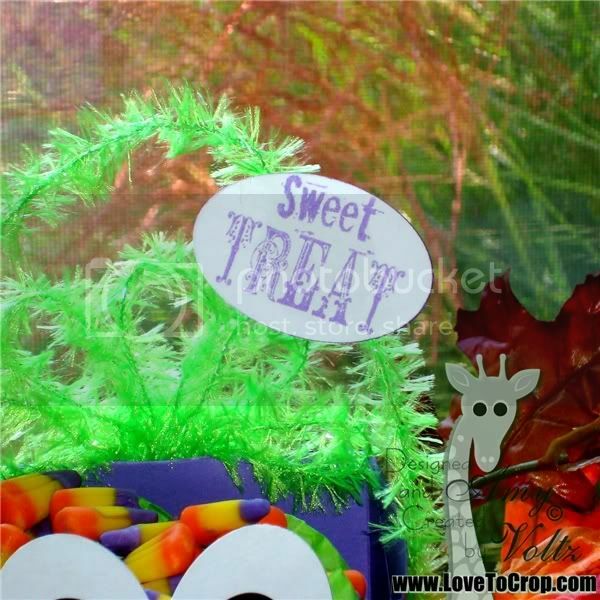 Just a great treat bag and Kristal's stamps are just perfect! P.S. Don't forget to come and post for my giveaway Sweetie!! I love your projects, that bag is so adorable! Hi Amy, these are so adorable and I would truly love to have the template! 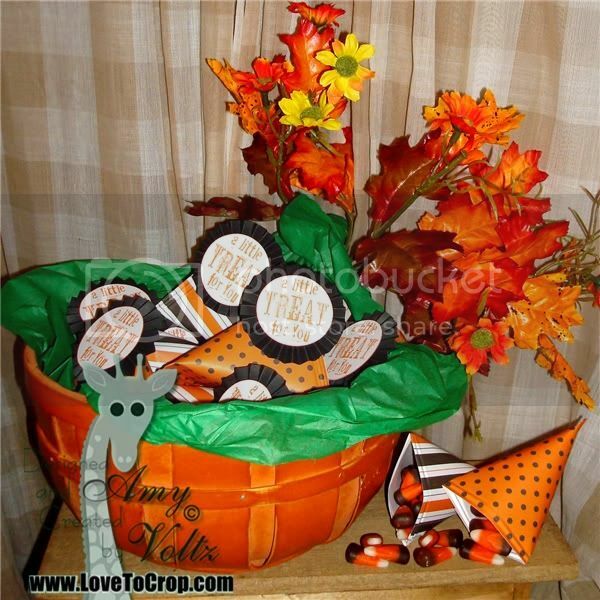 I also love the sour cream candy holders as well... so cute! You are just so creative and busy all the time!!!! Do you ever sleep? Thanks sweetie! Amy, I just love your style. You create out of the box. Love the Bag and the "Girl childs" sour cream cups...who wouldn't love them. Will go visit the other ladies. Great job Girlfriend as always. You sure did rock the SS challenge. Love ya! Wowzers....how cute is this! You totally outdid yourself on this project! I love the adorable bag amd those sour cream cups are awesone. Love the striped and polka dot paper! GREAT project and ideas for us...Love it Amy! Adorable treat bag Amy. I have had those oval templates by CM for years and NEVER thought to use them for this...great idea!! !